I really like some of the problems in Knight’s College Physics. AP Physics 2 students white boarded problem 61 in chapter 28 today. This question aligns well with the College Board’s Science Practice 7: “The student is able to connect and relate knowledge across various scales, concepts, and representations in and across domains.” This problem starts with the wavelength of a single photon emitted by an LED and asks what current is necessary to produce emitted light of the specified power. 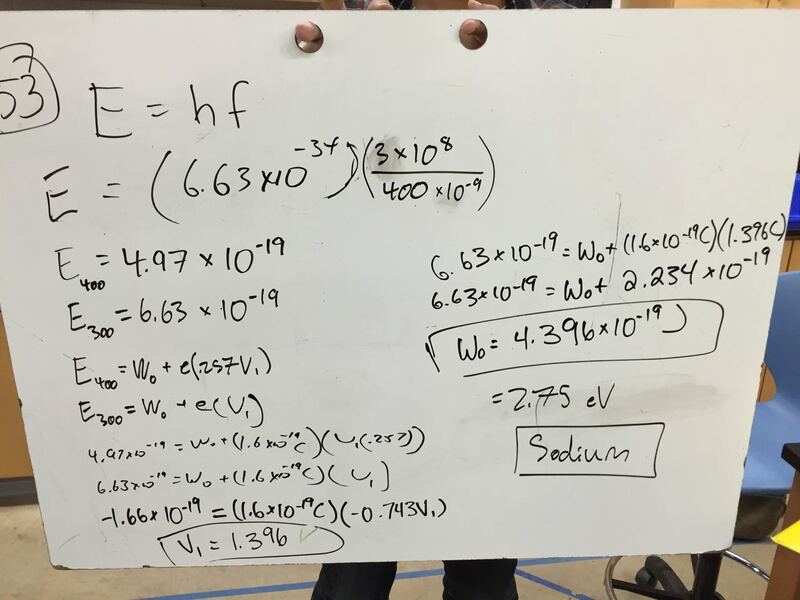 The following whiteboard again illustrated that students haven’t yet had the opportunity to assign meaning to the slope of a stopping potential versus frequency graph for the photoelectric effect. They solved simultaneous equations instead of using the value of the slope. This year, I’m saving the quantitative photoelectric effect lab for a lab practicum. Next year, I’m considering doing the lab earlier so students have a deeper understanding of these graphs throughout the unit.